Eigg  lies 10 miles of the coast of Scotland amongst the Small Isles. Eigg is owned and cared for by the Isle of Eigg Heritage Trust  which was set up in 1997 by residents of Eigg and various other organisations. the Sgur of Eigg taken just before landing. The Caledonian MacBrayne  ferry MV Lochnevis sails to all four of the Small Isles from Mallaig throughout the year. It calls at Eigg once on Monday, twice on Wednesday, twice on Friday and once on Saturday during the winter; twice on Monday, once on Tuesday, twice on Thursday, once on Friday, twice on Saturday and once on Sunday in the summer. During the summer, Arisaig Marine  provide wildlife sightseeing cruises/ferry services from Arisaig, about 10 miles south of Mallaig. Different islands are called at on different days, but the timetable generally allows access to the Small Isles on days when the CalMac ferry does not. If travelling by day train, travelling to Eigg from anywhere further south than Fort William is only possible without an overnight stop in Mallaig on summer Saturdays, when the early morning train from Glasgow Queen Street station connects with the second CalMac sailing to Eigg. Travelling from Eigg to points beyond Fort William by day train is likewise only possible on summer Saturdays and Sundays, when the first CalMac sailing from Eigg connects with the train to Fort William and Glasgow Queen Street on Saturday and the Arisaig Marine ferry allows passengers adequate time to reach the station at Arisaig in order to catch the train to Fort William and Glasgow Queen Street on Sunday. It's a small island, so it's easy to walk from end to the other. The Singing Sands and the beach at Laig Bay - near Cleadale, in the north of the island. 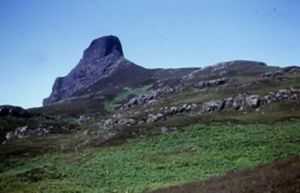 An Sgurr is a large crag in the southern end of the island - Eigg's highest point (393m). An Sgurr is as pleasant to climb as it is to see from afar. A trail from the ferry landing leads to the summit, with no climbing difficulties. Be even better prepared for cold and wet than you would be if you were only looking at the summit, not climbing it, and be careful of how much time you're taking, so that you can be back to the landing before the ferry sails back to Mallaig or Arisaig. Massacre Cave is an historic site of some significance, a short-to-medium walk from the ferry landing. The Anniversary Ceilidh, celebrating the community buyout of the island, occurs on a Saturday around the 12th of June every year . A craft shop near the pier at Galmisdale sells locally produced goods as well as a range of books and souvenirs. There's a tearoom near the pier at Galmisdale. There are a number of guest houses, self catering cottages and bothys, plus a basic campsite by the bay near Galmisdale. This page was last edited on 24 March 2019, at 23:45.